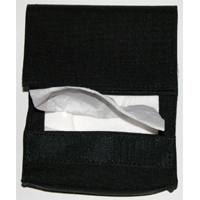 The ACG Kim Wipes Pouch is designed to hold approximately one quarter of a box of small kim wipes. The front of the pouch has a plastic window with a slit for quick and easy removal of the wipes without needing to open the pouch (like a box of Kleenex). The pouch measures 5" x 5".